Asia Superyacht Rendezvous 2016, one of the most exclusive events on the Asian and world superyacht calendars, welcomes new Co-Sponsor Benetti Yachts aboard the 16th annual sail & motor superyacht event to be held December 16-18 in Phuket. The sun, sail and six-star superyacht spectacular, the largest of its kind in Asia, attracts a fleet of superyachts and their owners, captains and VIP guests from around the world. The extensive gathering of superyachts provides a spectacular setting on and off the water for friendly camaraderie and exploration of surrounding cruising grounds by owners and their guests. Benetti is proud to join the prestigious coterie of Asia Superyacht Rendezvous Sponsors, greeting vessels from Asia and around the globe, arriving to enjoy friendly races and festive social events. With the highest growth rate among the world’s manufacturers of super and mega yachts, Benetti is an icon of timeless Italian style and elegance known for its building excellence. Established in 1873, Benetti is the Italian luxury shipyard with a long and successful heritage, reflecting its owner’s distinguished personal style and needs in every fine detail. 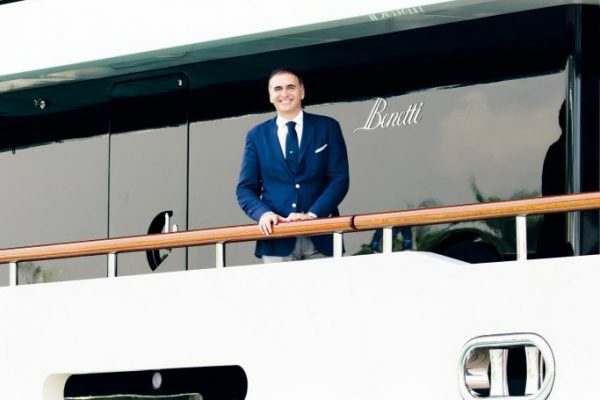 Vincenzo Poerio is CEO of Benetti Yachts, and Fabio Emetto, CCO, with facilities in Viareggio, Fano, Livorno and offices in Fort Lauderdale, Dubai and Hong Kong. Benetti is part of Azimut Benetti Group, the world’s largest private group in the yachting sector. Benetti Asia entered into the Asian market in 2010 with its primary office in Hong Kong. The city is also the base for Dedicato, a 5-year operation program giving all Benetti yacht owners an all-in-one solution. Benetti launched its aftersales office in Gold Coast Marina in Hong Kong with a 24/7 stand-by Service Manager available in 2015. Benetti currently has a fleet of fourteen yachts based in Asia Pacific with eight in Hong Kong ranging from 93ft to 65m and is headed by General Manager, Nizar Tagi. The Rendezvous will kick-off opening night with a cocktail party aboard the phinsi-style Dunia Baru prior to the next morning’s superyacht sail racing. Following the first day of racing the famed model boat-building and races will take place. The ‘Benetti Challenge’ will be held amidst a relaxed tropical party setting presided over by Co-Sponsor Benetti. The festive scene will be staged at the beautifully situated and stunning host hotel, the SALA Resort & Spa Phuket. The popular model boat design & race sparks some major jousting for ‘bragging rights’ from competing superyacht teams, each creating a model sailing vessel capable of winning the wild and fun gutter boat race. ASR 2016 is one of the few regattas in the world that allows both motor and sailing yachts (75’ and longer) to participate alongside each other, with sailing superyachts racing on a course marked by power superyachts. Participating high profile yachts from among the many attending past events, include: the 65-metre SY Lamima the world’s largest operational wooden sailing boat; the 31-metre SY Lady Thuraya; the 40-metre MY Vie San Soucis; the 32-metre, MY Antares; the 67-metre Archimedes; the 50-metre Liberty; and the 65-metre Callisto, to name a few. The growing popularity of yachting in Asia makes the Asia Superyacht Rendezvous the ideal platform for the select sponsors and media partners to increase brand awareness and meet directly with owners and captains as they align their company with an event that epitomizes prestige and excellence.